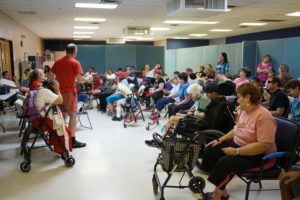 This program focuses on providing adults with intellectual and developmental disabilities experiences and activities geared to increase their abilities in areas of their lives including personal care, socialization, gross and fine motor skills, communication, and community and leisure activities. Program participants can engage in a variety of structured activities in the facility to promote skill development. In addition, an integral part of the program is using the community as an experiential resource. Museums, restaurants, stores, parks, movie theaters, botanical gardens, farms, and a wide variety of places are used to help the participants learn what is available to them as citizens. The DTA program can be seen as a precursor to vocational training, offering pre-vocational skills including hand-eye coordination, attention to a task, working cooperatively to complete a project, and response to supervision. DTA is also used as a supplement to vocational training, offering socialization and community leisure experiences to help broaden the participants interactions with others and community awareness. DTA is a unique resource assisting participants in maintaining the skills they have, while trained staff provide physical or supportive assistance as needed. The program offers a 1:4 staff-to-participant ratio to promote a positive therapeutic environment.